No, not the 1997 action drama starring Tommy Lee Jones; I’m talking about an actual volcano. When I was a kid I was both fascinated and terrified by volcanoes. Just hearing what happened in Pompeii made me wonder why on earth anyone would ever consider making a town at all near a volcano. 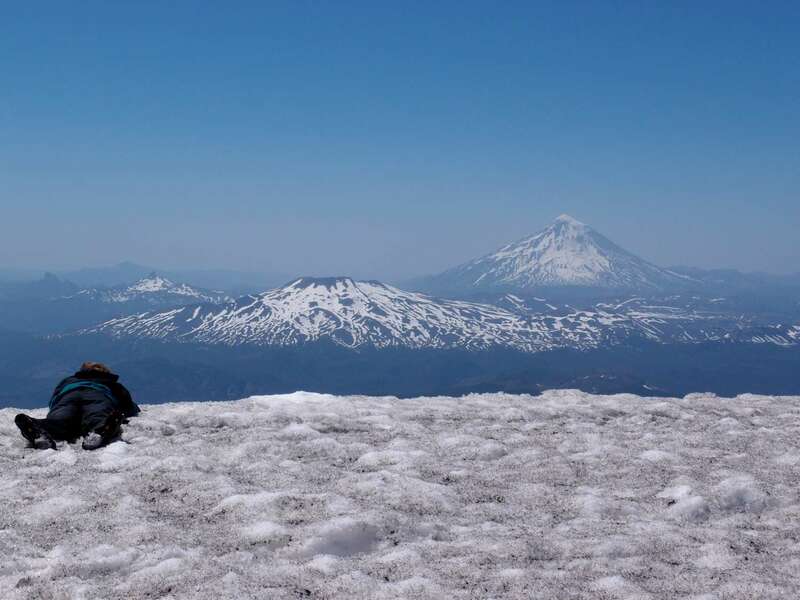 Chile has around 2000 volcanoes, approximately 59 of which are classed as “active”. The Chileans must be aware of the destructive power of volcanoes and yet they still build towns practically at the base of them. I’m not sure if it is the “better to die (almost) instantaneously than of ash inhalation and/or dead crops and polluted drinking water” mentality or because it just makes the horizon look quite nice but Chileans seem to love to be close to active volcanoes. Today we decided to get in the Chilean spirit and get as close to a volcano as is possible without dying. As Anna mentioned in the last post, we are in Pucón which is right next to one of Chile’s most active volcanoes, Rucapillán. This is the volcano we decided to scale. 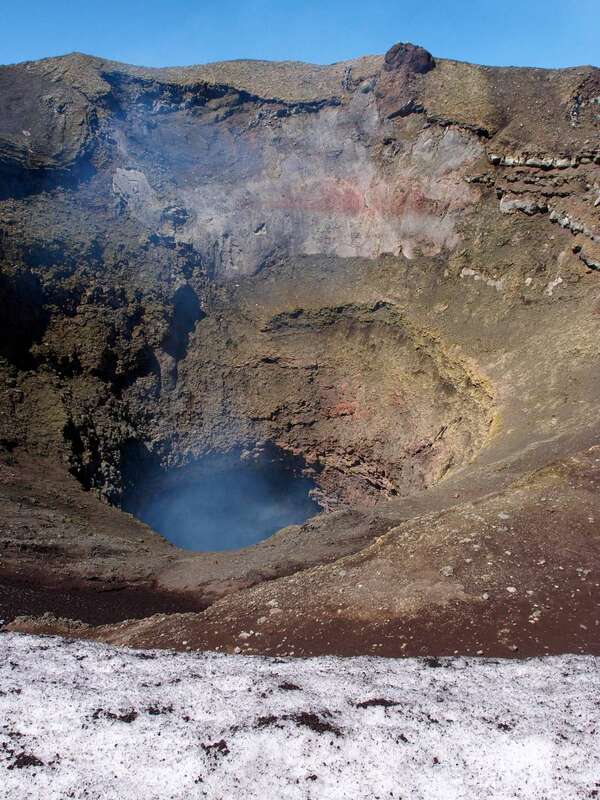 It is 2800 metres high and is one of only a handful of volcanoes which actually have lava flowing around in the cone. Rucapillán has quite a history of eruptions; in recent times it erupted in1964, 1971 (leading to 15 deaths – cite wikipedia) and I think our tour guy said that it did in 1994 as well. So it is pretty active and apparently people become more worried when there isn’t smoke coming from it since it may indicate a build up of pressure. 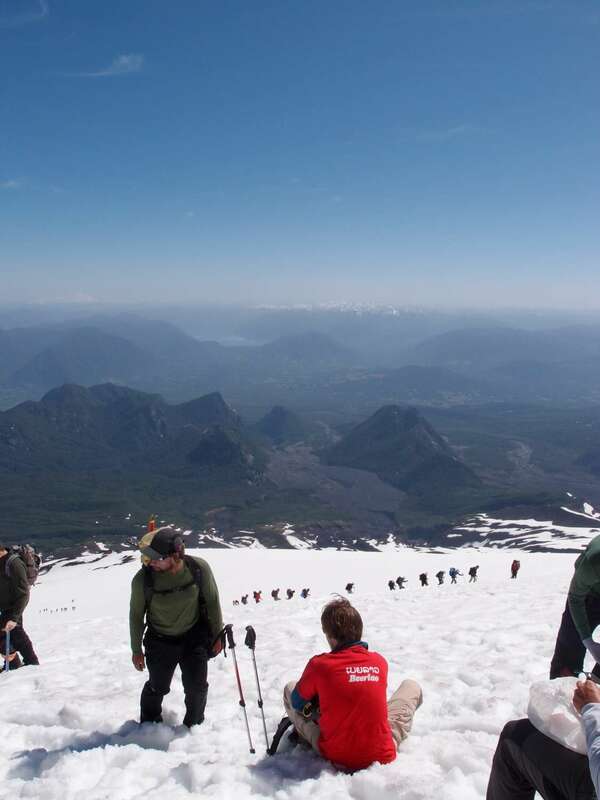 You can’t climb Rucapillán without a tour group which at first sounds ridiculous but the volcano is basically completely covered in snow all year round so climbing it involves use of ice picks and proper footwear so really it makes a lot of sense. The first section of the climb is actually fairly terrifying if you are not used to walking up steep hills on snow; it just looks like you could slip and fall so easily. After a while you do get the hang of it and the best way to do it I discovered is to just look at your feet because otherwise the height will freak you out and you may loose your footing. The good news is that if you do slip and fall odds are you will basically just roll down the snow (unless you’re unlucky and hit jagged, volcanic rock). The climb was pretty boring; it involved basically zig-zagging up snow for 3 hours until we reached the summit. The up side is (and I probably don’t need to say this but) the view was amazing. You could see the Andes and also three other towering volcanoes in the area. We could only really steal glimpses during the climb lest we loose our footing but it was great none the less. Even though we could not see any lava at the summit, we could hear it; it sounds kind of like water crashing against rocks at the beach. Some years it is high enough to be easily seen but we weren’t that lucky. One of the tour guys took a couple of us around the crater. The wind was blowing pretty much constantly in one direction so I am not sure why no one thought there would be any issues but we basically walked straight into the path of the smoke from the crater. The smoke, while mostly is made up of water vapor, also contains a fair amount of sulfur and chlorine so it was fairly unpleasant and kind of made your breathing passages feeling like they were burning. The tour guy was too dedicated to turn back so we ran through the smoke trying to not breathe it in so we could continue hearing about neighbouring peaks. It was a little painful. Apparently there is also a couple of glaciers on the volcano but I was unaware of this until after the climb. Getting down was the best bit; walking is for idiots, we had these little sled things (basically just like a plastic plate which you sit on) which we used to get down at a nice speed. It was quite exciting but you had to get used to how to control it and it gets snow everywhere. I lost control once on the way down and it happened to be while hurtling towards this slab of concrete. A tour guy saw me and stood between me and the piece of concrete; I’m not sure what he was planning, maybe just to catch me or something but I think he would have ended up more hurt than I would if I hit the concrete block. Anyway my first plan was to just stick my ice pick into the snow like they do in movies to stop myself. It managed to stop my ice pick but it did nothing for me. So I went to my backup plan which was to turn on my side and stick my shoes hard into the snow. This managed to work and I came to a halt maybe 30cm away from this guy and managed to cover him in snow. I was embarrassed about losing control but also felt a little proud of myself for having a movie-like closeness to hitting the guy. So we managed to get down to the bottom of the volcano safely, I think it took us 30 minutes (it took 3 hours to get up). It must have been 29 degrees or something at the bottom of the volcano so we had to quickly take off all our snow gear to avoid cooking in our own juices. There still managed to be chunks of snow down the bottom as well which was a little interesting. On an unfortunate note, Sven is the first of our group to get food poisoning and could not climb the volcano. The food culprit is unknown and could be anything. We have more of that to look forward to before this trip is over! So we have the rest of the day to relax in our hostel here (which by the way was excellent, stay at Ruka Pucon if you’re ever in Pucon) before heading to Puerto Montt to catch a 4 day ferry to Puerto Natales. Soon we will be more south than we have ever been before! We are not sure whether the ferry will have wifi, so it may be a few days before our next post. Adios amigos! Slow climb to the top and its a slippery slope to the bottom – fantastic pictures – and congratulations on your first class honours Nick – well done! Gripping story. I couldn’t stop reading! awww I hope sven feels better (well he should be now).